Fearless investigative journalists Sheldon Rampton and John Stauber (Toxic Sludge Is Good for You! and Mad Cow U.S.A.) are back with a gripping exposé of the public relations industry and the scientists who back their business-funded, anti-consumer-safety agendas. There are two kinds of "experts" in question--the PR spin doctors behind the scenes and the "independent" experts paraded before the public, scientists who have been hand-selected, cultivated, and paid handsomely to promote the views of corporations involved in controversial actions. Lively writing on controversial topics such as dioxin, bovine growth hormone, and genetically modified food makes this a real page-turner, shocking in its portrayal of the real and potential dangers in each of these technological innovations and of the "media pseudo-environment" created to obfuscate the risks. By financing and publicizing views that support the goals of corporate sponsors, PR campaigns have, over the course of the century, managed to suppress the dangers of lead poisoning for decades, silence the scientist who discovered that rats fed on genetically modified corn had significant organ abnormalities, squelch television and newspaper stories about the risks of bovine growth hormone, and place enough confusion and doubt in the public's mind about global warming to suppress any mobilization for action. Recent surveys show that "national experts" are the third most trusted type of public figure (after Supreme Court justices and schoolteachers). 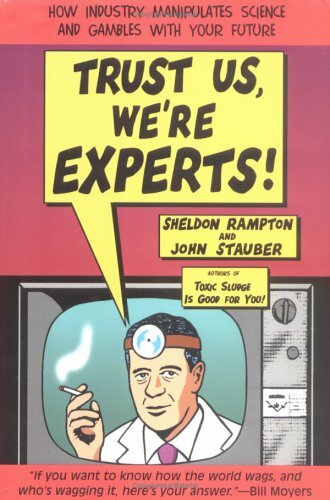 Hard-hitting investigative journalists Rampton and Stauber (Toxic Sludge Is Good for You!) ask whether that trust is misplaced. They assert that, with highly technical issues like environmental pollution and bioengineered foodstuffs, "people are encouraged to suspend their own judgment and abandon responsibility to the experts." The authors examine the opinions of many so-called experts to show how their opinions are often marred by conflicts of interest. Peering behind the curtain of decision making, they catch more than a few with blood money on their hands. From spin doctors with dubious credentials to think tanks that do everything but think and scientists who work backwards to engineer desired experimental results, Rampton and Stauber present an astonishing compendium of alleged abuses of the public's willingness to believe. Particularly sobering is their summary of the historical use of "experts" by the tobacco and mining industries, which, they reveal, have suppressed and manipulated information in order to slow industrial reform. Their allegation that industry flaks may be purposely clouding the current debates swirling around "junk science" and global warming issues should provoke readers to reexamine these matters. Rampton and Stauber's impassioned call for skepticism goes beyond rhetoricAthey also offer practical guidelines for separating propaganda from useful information. Agent, Tom Grady. (Jan. 2) Forecast: The authors' gloves-off approach, which is effectively signaled by the pointed and irreverent cartoon-style jacket, will appeal to fans of Bill Moyers, Jeremy Rifkin and Barbara Ehrenreich (who all blurbed the book). Rampton and Stauber's impassioned call for skepticism goes beyond rhetoric-they offer practical guidelines for separating propaganda from useful information. Trust Us, We're Experts! is a brilliant piece of investigative journalism and a powerful vaccine...spread it around! Read, get mad, roll up your sleeves, and fight back. Rampton and Stauber have issued a wake-up call we can't ignore. Stauber and Rampton have once again exposed the ugly underbelly of corporate America's psychological war on our citizens. If you want to know how the world wags, and who's wagging it, here's your answer. Read...and fight back. This is a great book, and I think you should buy it. Finally a long-overdue expose of the shenanigans and subterfuge that lie behind the making of experts in America...An eye-opener. The authors of Toxic Sludge Is Good for You! unmask the sneaky and widespread methods industry uses to influence opinion through bogus experts, doctored data, and manufactured facts. Over the past decade, corporations and public-relations firms have seized upon a remarkable new way of influencing opinion called the "third-party technique." The method is simple-just put your words into the mouth of someone who appears impartial, such as a doctor, professor, watchdog group, or an "expert" of some kind. Written with biting humor and penetrating insight, Trust Us, We're Experts! exposes the current and very effective methods of opinion manipulation practiced by the corporate powers that be. Two journalists unmask the sneaky methods the industry and science uses to influence opinion, through fake experts, doctored data, and manufactured facts. Shows how corporations and public relations firms exploit consumers to get them to buy what is being sold to them. DLC: Industrial publicity--Corporate practices--United States. John Stauber is the founder and director of the Center for Media & Democracy. He and Sheldon Rampton write and edit the quarterly PR Watch: Public Interest Reporting on the PR/Public Affairs Industry. John Stauber & Sheldon Rampton write and edit the quarterly PR Watch: Public Interest Reporting on the PR/Public Affairs Industry.